Cuisinart Sale on Rue La La Today 02/14/13 | A Savings WOW! Right now, on Rue La La, you can get select Cuisinart products at a great price! 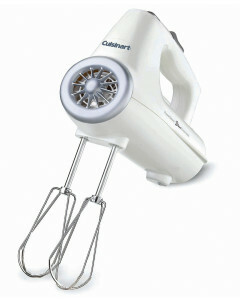 For example, this Cuisinart “PowerSelect” 3-Speed Hand Mixer is normally priced at $55, but you can get it for only $26.90 at Rue La La. They also have a selection of cookware, food scales, bakeware, grills, and more. Quantities are limited for these, so act fast if you want to purchase some!